“The Young and the Restless” spoilers for Wednesday, June 14, tease that Abby (Melissa Ordway) will get some irritating news. At Newman Enterprises, Abby discovers that Scott is now in charge of the digital media company. She objects, but eventually decides to throw herself into her start-up project. Abby feels like her success will be far greater than Scott’s. At Crimson Lights, Tessa (Cait Fairbanks) tries to make a break for it after spotting Zack (Ryan Ashton) with Sharon (Sharon Case). Zack goes after Tessa and they have a fierce confrontation. Tessa wants to know what Zack’s doing there. She suspects he’s going to create issues for her, but he insists that he already left their past behind. Later, Sharon updates Scott on Tessa and Zack’s former relationship. She wonders which one of them caused problems. Scott pushes Sharon to let Noah (Robert Adamson) handle his own love life. Sharon makes plans for dinner with Scott at her place and they lock lips. Back at the coffeehouse, Abby and Zack get flirty. Meanwhile, Victoria (Amelia Heinle) assures Neil (Kristoff St. John) that the legal drama will be over soon. Neil seems to have his doubts. At home, Cane (Daniel Goddard) tells a worried Mattie (Lexie Stevenson) that he’s just caught up in work stuff. He doesn’t want his daughter to fret. Mattie bumps into Reed (Tristan Lake Leabu) at the park café later and finally hands over her phone number. When Charlie (Noah Alexander Gerry) appears, Reed lashes out at him for stealing his ex. Things get awkward when Mattie admits that Charlie is her brother. Other “Young and the Restless” spoilers say Hilary (Mishael Morgan) will offer Juliet (Laur Allen) more advice. At the athletic club, Hilary insists that Juliet shouldn’t settle. She notes that Juliet will look like she’s backing down from false claims. When Neil learns Hilary put Leslie (Angell Conwell) on this case, he’s not happy. Neil rips into Hilary for going after the people he loves. The judge hears Leslie’s argument and determines that the case should move forward. Michael heads to Brash and Sassy to fill Victoria in. Cane and Victoria find out that this is going to trial. Leslie arrives with another chance to settle, but Victoria scoffs at her offer. She refuses to admit defeat when Juliet is a liar. Michael gives Victoria a shock when he reveals something Leslie mentioned. He explains that Cane almost tanked the Tokyo deal. In Juliet’s suite, Cane bursts in and insists that they have to talk. He’s determined to make Juliet listen to what he has to say. It sounds like more trouble is brewing. We’ll keep you posted as other Y&R details and rumors emerge. Stay tuned to see what’s coming up in Genoa City. 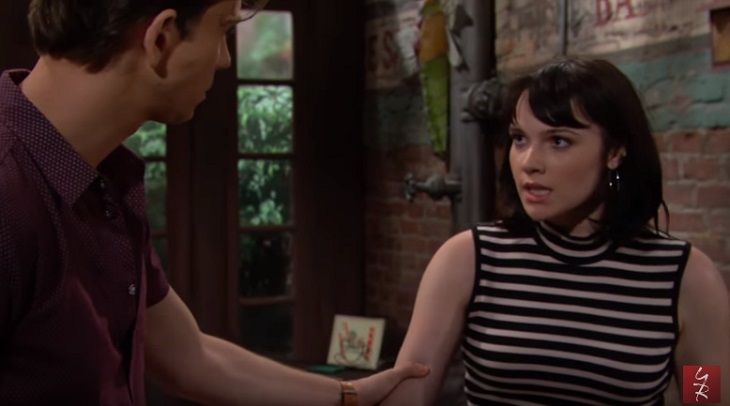 The Bold And The Beautiful Spoilers: Could Wyatt And Sally End Up Together On B&B? Bubble Bubble Toil & Trouble……… hopefully there’s a mend in sight for the Abbots, Hillary may have pushed too hard but there is still that “little” matter of Cane having that tape edited causing B&S to almost lose the whole deal. That needs to come to light so that Mr. Self Righteous can stumble and fall!! !